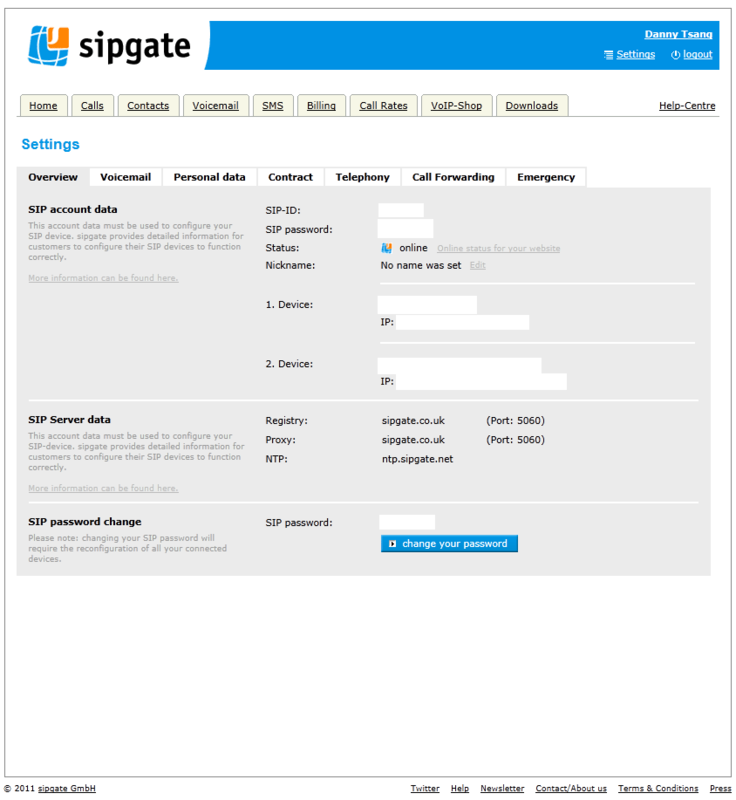 sipgate provides a SIP trunk which can be used to make or receive calls. It has one of the best cost value I have seen because there are no line rentals, a local number can be selected within the UK or have a premium non-geographic number. The price of calls are also cheaper than my current teleco (Virgin Media). I missed this opportunity but before registering ensure you can perform tests within 15 minutes of signing up. Sipgate allows free calls for testing after verifying your email address. With this in mind continue to setup FreePBX before signing up to gain maximum number of time for testing! Trunk name for both sections are required but can be named differently but for this example it’s called sipgate. The fields which have brackets around them “” means this comes from sipgate and requires going to sipgate’s settings page to get it. For now enter some random number and it can be replaced later. If you have been following my guide then continue configure the rest below otherwise scroll down. Click Submit Changes button to save the trunk. The description is again a personal choice, the [SIP-ID] is on the sipgate website. Just like before enter a random number for now and it can be changed later. The destination should be the device or devices it should ring. Press the submit button to save the inbound route. Route name is customizable and so is the dial pattern but the above is similar to the default “dial 9 for outside line” except this is set to 8. This override is required when adding credit to sipgate account for making outbound calls. Alternatively use a sip client to connect to sipgate. The trunk sequence should include the sipgate trunk created at the top of this section. Submit the changes to save. If you have not listened to what I have said and you have already signed up to sipgate.co.uk then apply the settings and your ready to test/use. I also had to disable SIP ALG in my Netgear WNDR3700 router. This is located in WAN Setup > NAT Filtering and checking the Disable SIP ALG. Without doing this you may not hear the caller. Go to http://www.sipgate.co.uk and sign up. The password for accessing the site will be different to the one used Once complete and your email is verified login to sipgate and click on Settings on the top right of the screen. It should be under your full name. The Overview tab will contain all the information needed. Go back and enter the details in FreePBX, submit the changes and apply the changes for the settings to take hold. Adding credit for the first time to the account is simple if the system worked. Just like a topup it asks for amount to credit the account, payment details and security code… The security code can be obtained by calling the number 10200. This number can only be called from sipgate. A good way to weed out robots. The problem was I rang the number but there was no sound on the call. The call was definitely answered and I could hear and talk when receiving calls. I even tried opening ports and tried using the STUN server to connect to sipgate but I still had the same issue. It turned out this was a NAT/Firewall issue which blocked incoming voice data which was solved in the NAT section. After configuring it correctly I got through to the automated number and entered the security number. Before I fixed it I used Paypal instead which did not require a security number. sipgate is a very affordable SIP trunk compared to other services I have seen including Skype (for SIP/ Connect) which require a monthly fee similar to a monthly line rental charge. The call rates are also fairly cheap and also provides emergency call locations to emergency services. You can pick the locale of the phone number which is a nice option to masque or provide friends and relatives a local number. I.T software professional always studying and applying the knowledge gained and one way of doing this is to blog. Danny also has participates in a part time project called Energy@Home [http://code.google.com/p/energyathome/] for monitoring energy usage on a premise. Dedicated to I.T since studying pure Information Technology since the age of 16, Danny Tsang working in the field that he has aimed for since leaving school. View all posts by Danny →	This entry was posted in PBX and tagged Asterisk, CallerID, firewall, FreePBX, NAT, NAT Filtering, netgear, SIP, sipgate, STUN, telephone, telephony, UDP, virgin media, WAN. Bookmark the permalink. I have my Superhub set to modem mode and apart from changing the setting on the Netgear router it worked fine with sipgate. Sipgate’s site report whether there is a connection to the service in the settings pages. I’m not sure if you can receive calls if you have no credit because I currently have credit loaded. i have followed your guide and it has worked – thanks… but i have 2 sipgate numbers, and while both can dial out, only one will work for incoming. any suggestions?